I don't expect every week to be giggles and whoopee cushions, although to be honest most weeks around here are just that, but some weeks things are decidedly out of sorts. This has been one of those weeks where the whole world has been just a bit off kilter, not a bad week, and nothing terrible happened, in fact it has turned out quite glorious, but sometimes you have to stop and remind yourself to look for the good. You see it has been a bit of a cancer-ish week. I am fine... in fact I am doing amazing, but it has been a week or so with lots of tests and things for baselines for new medication, managing new side effects and booking the upcoming two year scans and ultrasounds. Nothing major or bad in any way, shape or form, but you kind of get out of the whole medical swing and heading back into those environments again kind of gives you a bit of a jolt. Added to all that I got back into the Cuppa With Friends Project as part of ICAD. I started this two years ago and was in the middle of loving every minute of painting up peoples' cups and mugs when I was diagnosed with advanced breast cancer and faced those initial awful, scary weeks of tests, operations and all that. It was all pretty horrifying as you can imagine and the project fell by the wayside. I have tried to get back into it a few times since then, and every time I have done a few it stirred all those memories up all over again and being the shallow pool that I am I just moved onto other things rather than deal with it all, but I am feeling so great and life is very very good so I figured it was time to dive in again. The first few were a bit of a task and I sort of did them at the end of the day, but as I am getting into the swing again and cup and mug paintings are starting to accumulate on my desk in a satisfying pile, I am finding I am just enjoying it all. I even managed to start the day with one today which is at the top of this post, and it didn't make me think anything other than extreme pleasure. The mug is from one of the members of my class called Yolanda, who just this last week or so has faced her own cancer battles and is dealing with it all with grace and creativity, and quite frankly is inspiring. 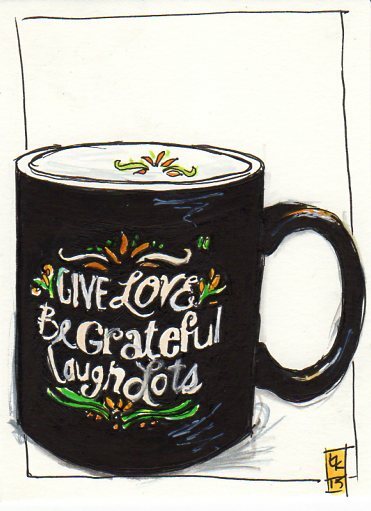 Throw in some mugs from people like Arnoldo, who not only had sent in a glorious pun mug, but who also wrote about vulnerability so eloquently on his blog last week that it started me thinking about dealing with some of this, painting the mug of fellow survivor and friend, Carol. Plus others who are just from people who I admire and like, and who have awesome taste in mugs and cups. So all good and positive, but then the book A World of Artist Journal pages by Dawn Devries Sokol arrived and I sort of plunged back into a bit of a mini funk. My work is in there... just a single image,but I painted the page and sent it in during treatment, which was quite the task. At the time it was really positive because it gave me things to focus on when I was deep in the horrible chemo, but when I thought of that page post treatment I thought of the cancer and quite frankly it doesn't even look that much like my work. I have actually been avoiding buying it for just that reason. which is a bit wimpy really but then a friend bought it and emailed me to say how wonderful my page was, and that it was just where I was at the time, and I am not there now and it is something I should be proud of, not just because my work was in a book, but also because it represented how far I have come. I have some pretty awesome and wise friends I have to say. So the book was ordered in a wave of pep talk induced bravery. This is such a beautiful post! 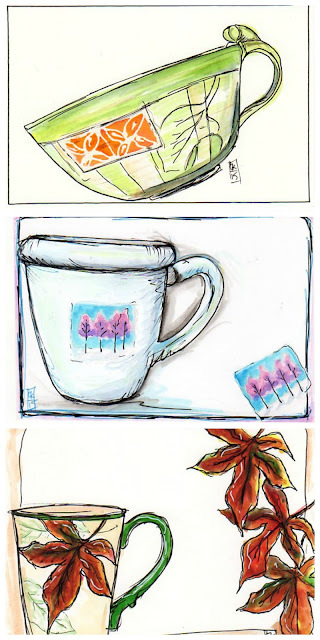 I enjoy seeing the different cups from everyone illustrated -- glad you're feeling better and hope you continue to share your creations! Oh my. It's 7:15am and I am sitting here trying like heck not to cry. You make ME feel blessed to have known you along this difficult (understatement!) journey and to see/hear you come out the other side into your second year makes my heart lift and my soul sing. Your art is as bright as the joy you give and the smiles you create. Carry on! Life is very good indeed and I am so happy you closed that chapter and are all better now! Your art never fails to make me smile! I'm glad to hear that you're doing so well, and that you're back to and enjoying your tea cups, I always enjoyed seeing these. And how wonderful to have your painting included it that book, it sounds like an awesome book and your painting is gorgeous! Thanks for this vulnerable heartfelt post! You've come a long way baby! The artwork although gorgeous does have less colour than usual, but what a beautiful metaphor....it was a time when the colour had drained from your life...and now it's again fully restored! I understand it's tough to look back...but wow it was such a defining moment you braved through, a time to honour. I admire what you've come through!You are such a wonderful inspiration, creatively and as amazing human being! I'm so glad you are basking in what you've accomplished! 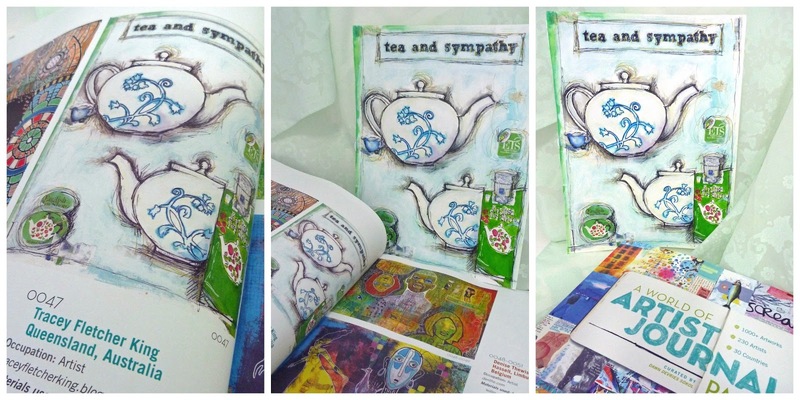 Just love the cuppa project! So vibrant and full of life, just like you! Tracey, do you have any idea what an inspiration you are to everyone? It all sounds literally terrifying, but I am a firm believer that in everything, if you look hard enough you'll find the good and positive. Even with the battle you've been through... just look at where you are now! You are a definite hero with such amazingly, beautiful, talented art skills that brightens everyone's day. Now that's enough smooshy stuff... let's get painting. I'm off back to the classroom to try and catch up, before I'm put on detention for lagging behind. I think there is definitely something "off" in the universe this week. As you said, not a bad week but just not quite as bright and sparklely as life can be. I am glad to see all your cups as they are gorgeous. 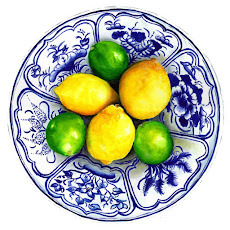 Hoping to get back and finish up those June videos drawing fruits and vegs once I get through today. Enjoy your weekend! I am sorry to hear about your latest battle with cancer, but exhilarated to hear you are winning, my friend. Your positive attitude and glorious artwork are an inspiration for all of us around the world who are blessed with your wisdom, words, and artwork. Congratulations on your work being featured in Dawn's new book. That's very exciting! I'm also thrilled to see the painting you did of my precious cup, which I got from my wife when we were dating, on your blog. Thanks for the shout out as well. May you and your family continue to be filled with blessings of courage, strength, and peace. Tracey, you always speak so honestly from the heart and it is always refreshing and inspiring. Lots of congrats on your art being published. Well deserved. The painting in the book is wonderful, but it is funny how when you see your own art you see the feelings and times of when it was painted, instead of seeing the actual piece. I have some like that too. But i am so glad you are back to the cups project, they are just beautiful! Hoping your next week is easier. Lovely work this week Tracey, all the best going forward with your treatment, always thinking of you. 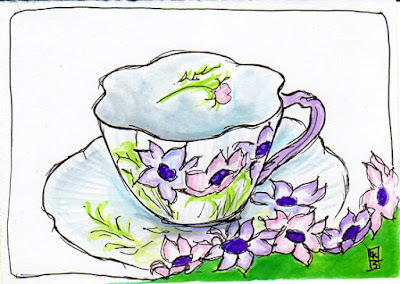 I'm so new here, and to PPF .... your words, your determination, your art, the wonderful comments left here are all so engaging and inspiring - I've loved your teacups and mugs(and kept going through previous pages! And then realised you are an Aussie too and only WISH I could attend one of your classes! I'm a bit awestruck! All the very best for your recovery. Hi Tracey. I'm glad you are back on track with your teacups. It sounds like a lot of fun. 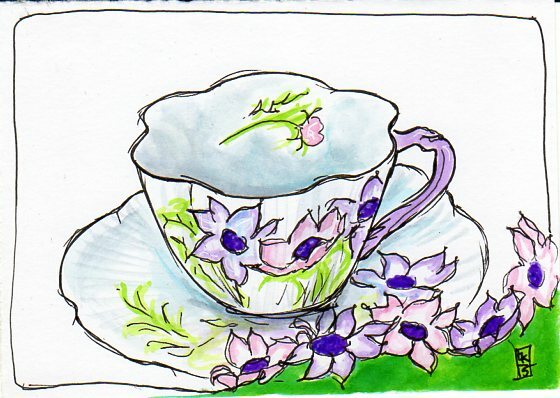 I have to try drawing teacups, it would be fun. I'm saddened though that you've had to deal with the tough matters at hand. You are a very brave and kind person. Sending you hugs. Congrats. on being featured. You deserve the best. Take care dear lady. Man what an emotional week you've had Tracey! But now I'm singing "I get by with a little help from my friends..." There is nothing like em. Love all your mugs-so happy to see them again, and congrats on having your beautiful work in the book! I'm sorry to hear you've had a rough week and equally glad you've pushed through. To face it, like you've done, will probably make it less "scary" next time you meet something that reminds you of that periode in your life. Good girls always have fun ahead, and you're one of them. glad to see all your tea cups. funny how little things like that can trigger bad memories. just so you know, i LOVE love love them!! Looking forward to seeing many more. As always you are a wonder and an inspiration! Sorry to hear about your off week but next week is definitely bound to be better. Love those tea cups! Hope next week is better for you. Your work looks amazing as always! 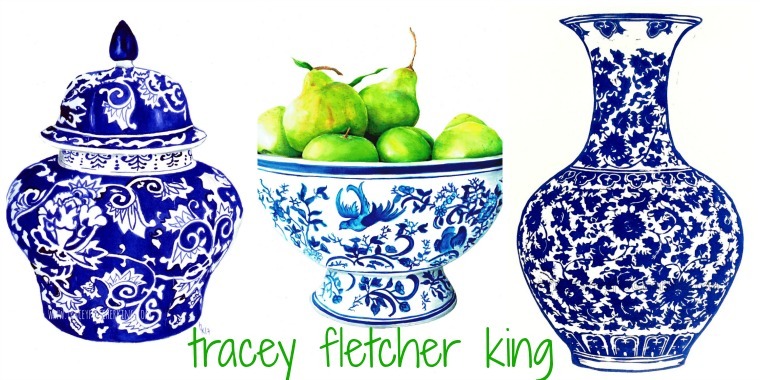 OH, Tracey, your works-of-art are always simply beautiful & inspiring! They make me smile! Blessings to you...take care of yourself. A serious, and reflective, post Tracey. You have come such a long way, and handled it all SO well. I'm grateful that we still have your talent and wit, and look forward to enjoying it regularly for a long time. I am enjoying ur cuppa project! Sending an extra hug today. I love the teacup series. Just wonderful. Thank you for writing such an open post. My pink hair for Claire came about when I lost my best friend in Dec of 2013 having being diagnosed only 6 months before in June 2013 with advanced breast cancer. Your positivity and frankness is what I love about you, I had only just found your blog then Claire was diagnosed and it was interesting to see how you both coped with it all. I cannot imagine what it must be like to have your art bring up such emotional memories so I am thrilled to see how you are embracing it and your printed page so wisely prompted by your friend. I may not comment on many posts you write, but know that as I read them on the fly to my son's afternoon sport or to my studio to teach my art class, you are a constant inspiration to me with your art, humour and your attitude. Thank you. I totally understand the mixed feeling you have around your published page and your cuppa project. It is very difficult to remember the hard times that were so painful. From my point of few... here is how I see you. First, I have told many people who have no interest in art about you. You are one of the bravest people I know. You persevered when it would have been so much easier to just give up on your art and lay in bed during all that horrible chemo. I remember having a down day and your blog would appear in my mailbox and you would be telling a story about Mushi licking your bald head to wake you up. That could have been such a sad, irritating experience but you made it into something funny and light hearted. You were very sick and yet you were making me laugh with your quirky view on life as you were living it at the time. I am so, so impressed that you had the energy and ump to paint the pictures you did and that you actually sent them in to a magazine. I don't think you realize what an inspiration you are to many of us. You weren't trying to be an inspiration. You were being you and that inspired me. When I count my blessing, you are one of them. I probably will never meet you face to face but I will always remember you and the many laughs I've had from you being you in cyberspace. How brave you are. ((hugs)) I'm praying for you. 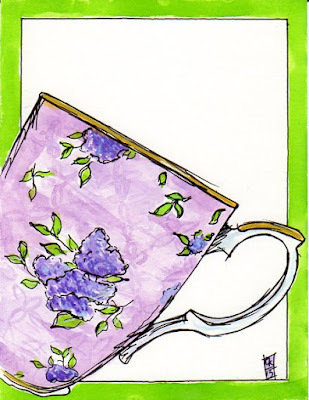 You are amazing--I adore your teacups too. Your artistic style is so unique and lovely. Your work fills my eyes. Hi Tracey I have been following your blog through out the 2 years you have been writing about today and rooting for you from the other side of the world even if you have never known I am here! What a week! And what a beautifully written post. 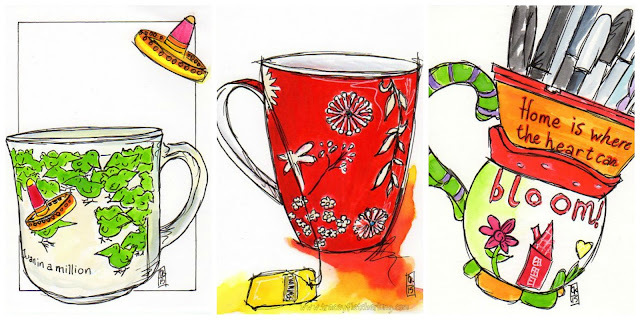 But I'm glad to hear how well you got through the week, and it's so nice to see your mug paintings (including mine!). Take care! You are so remarkable, Tracey. I draw strength from you and your ability to overcome. Your teacups and mugs are gorgeous. I haven't been through what you have, but I remember the times of respite when my late dh was having such good days we could forget all the tests, treatments, etc. if only for a short while. Then when they started up again, there was the medical scene all over again. settled with your new medication. has to fight against cancer too.